Lois E. LeBar (1907-1998): Professor of Christian education at Wheaton College from 1945 to 1975. Known as a demanding teacher, she specialized in areas related to the philosophy of Christian education and curriculum design. LeBar is perhaps best known for her 1958 text, Education that is Christian, a book-length philosophy of educational ministry that emphasizes themes in teaching, learning, and curriculum development. Although she passed away in 1998, her legacy lives on through her writing and through the many graduates that teach in the field of Christian education in colleges and seminaries around the world. Lois Emogene LeBar was born in Olean, New York on October 28, 1907 to Roscoe and Alta LeBar. Nestled in the rolling hills of New York's Cattaraugas County, Olean was known for its dairy industry, manufacturing plants, and rich supply of petroleum and natural gas (Congdon, Doty, & Thornton, 1940). LeBar's father was a successful hardware salesman, and her mother taught multiple grades in the local one-room schoolhouse. While LeBar's father was not interested in spiritual topics, her mother was a spiritual mentor of high degree. Later in life, Lois LeBar claimed that her mother's integrity and consistency was an enduring example of the Christian life (L. LeBar, personal interview, August 31, 1993). LeBar had two sisters, Mary (born in 1910) and Janet (born in 1915). While Mary was a lifelong companion in educational ministry, her sister Janet died at the age of thirty-six. By her own admission, LeBar knew at an early age that she would be an educator. Her mother's example was the most obvious influence, but young Lois also excelled in a variety of educational contexts. Along with regular babysitting responsibilities, she also helped her mother in preparing classroom activities and taught Sunday school classes at the age of twelve. LeBar enjoyed an active high school life as well. In addition to her studies (Latin was her favorite subject), LeBar was a member of the Olean High School basketball team and served as a representative of the Athletics Association. She also claimed membership in the literary department congress and the Wayside Association, a girls' society that sponsored plays, dances, and a variety of other social activities (L. LeBar, personal interview, August 30, 1993). LeBar's family belonged to the People's Methodist Church of East Olean, a small "mission" church established by the larger First Methodist Church of Olean. Her mother was a respected Sunday school teacher in this congregation, but by the time of LeBar's childhood, the church had been deeply influenced by the theological liberalism of the larger denomination (Congdon, et. al., 1940). Later in life, she claimed that she was never exposed to the doctrines of Christ's atonement and second coming in this church, instead imbibing a heavy dose of moralism and a sense that Christianity could be defined as adherence to a prescribed ethical code. Such teaching merged quite naturally with LeBar's perfectionist personality and, by her own admission, she developed a legalistic character that was anchored in self-reliance and dutiful obedience to parental rules. (L. LeBar, personal interview, August 30, 1993). This orientation to the Christian faith would soon be challenged. Desiring to follow in her mother's footsteps, LeBar left after high school (in 1925) to attend the Geneseo State Normal School, located about 80 miles northeast of Olean. While she secured a first-grade teaching appointment in Perry, New York upon her graduation in 1928, her sister Mary, also a Geneseo graduate, started teaching kindergarten in Geneva, New York. Mary's involvement with a small group Bible study among her fellow teachers led to her salvation and full understanding of the Gospel. She immediately began sharing this news with Lois, and in 1932, after a time of questioning, both sisters joined in embracing Jesus Christ as a personal Savior (L. LeBar, personal interview, August 30, 1993). This conversion experience prompted a deep desire for Christian service, and the sisters decided together that they would pursue vocational ministry. The decision certainly involved sacrifice. Both sisters were forced to relinquish hard-earned teaching jobs at the height of the Depression, and Lois was additionally forced to break an engagement with a man who disapproved of her proposed career change. Despite these barriers, however, the sisters took the advice of a local minister and enrolled at Moody Bible Institute in 1933. This setting provided a helpful balance of theoretical training and practical experimentation for Lois LeBar. In the Christian Education program, she studied under Clarence Benson, an evangelical leader who was fighting hard to combat the popular liberal religious education movement. The merger of the International Sunday School Association with the Sunday School Council of Evangelical Denominations, leading in 1922 to the formation of the more liberal International Council of Religious Education, pushed Benson to begin evangelical curriculum construction in earnest (Benson, 1934; Benson, 1936; Getz, 1969; Palmer, 1958). While Benson remained, in LeBar's estimation, too content-centered and entrenched in Herbartian methodology, he provided her with opportunities that shaped her career aspirations. Because of her teaching background, LeBar wrote primary lessons for Benson's "All-Bible Graded Series," the forerunner of Scripture Press curricula. She was given the opportunity to write articles and serve as associate editor for the Church School Promoter, a magazine designed by Benson to provide teachers with practical helps for Sunday school teaching practice. Perhaps most importantly, because of her exemplary work in this field, LeBar was hired as a special instructor of children's work at Moody in 1935, a position she held until 1942. Lois and Mary LeBar together were named co-alumni of the year for the Moody Bible Institute in 1959 (Moody Bible Institute Bulletin, 1959). While she was teaching at Moody, Lois LeBar recognized her need for further theoretical training in the field of education and thus pursued advanced coursework in two local institutions. At Pestalozzi-Froebel Teacher's College and Central YMCA College (later Roosevelt University), LeBar was exposed to the field of educational psychology. While Benson's classes had opened LeBar's eyes to the importance of organized subject matter, she credited these two institutions with raising her awareness of the needs and impulses of the learner (L. LeBar, personal interview, August 30, 1993). By LeBar's own admission it was at these schools that she developed a sense of the importance of active learning, developmental readiness, and the role of the teacher as facilitator and guide. She received a B.A. degree in Psychology from Roosevelt University in 1943. Combined with her continued work writing curriculum and implementing practical lessons as Sunday school superintendent at Chicago's Marquette Manor Baptist Church (from 1936 to 1940), the Moody years provided LeBar with a sold theoretical and practical base from which to draw. Visiting numerous Sunday schools throughout the 1930s and early 1940s made LeBar painfully aware of the need for educational renewal in this institution. When she became aware that Wheaton College was offering scholarships to pursue a newly developed master's degree in Christian Education, she embraced the opportunity for further training. Arriving in 1943, the LeBar sisters studied under Rebecca Price, who had recently received her Ph.D. in Religious Education from New York University. According to LeBar, Price had a significant academic influence in her life, pushing her to embrace the inductive study method for Bible teaching. This methodology, which seemed to LeBar far more helpful than Benson's deductive system, provided the foundation for a philosophy of education that emphasized student discovery and the application of Biblical principles. LeBar's master's thesis, entitled Children in the Bible School: A Textbook for Teachers, was a comprehensive and highly practical analysis of Sunday school instruction (LeBar, 1945). With topics ranging from the physical setting of the classroom and administrative tasks to the physical, social, emotional, and spiritual development of children, LeBar's work was immediately recognized as a significant piece. Benson's own Evangelical Teacher Training Association made the text available as a resource to teachers, and within two years of its completion, the Fleming-Revell Publishing Company approached LeBar about potential publication. The book was finally published in 1952 (LeBar, 1952). Lois and Mary LeBar began teaching at Wheaton College in 1945, initially filling a spot created by Price's leave to teach at Biblical Seminary. As the prospect of a permanent position became more likely, the sisters recognized their need for doctoral level training. Recalling Price's own graduate experience, the LeBars opted to study at New York University (1946-1949), an institution that seemed to welcome evangelicals into the Religious Education department (L. LeBar, personal interview, August 30, 1993). The sisters studied under Samuel Hamilton and D. Campbell Wyckoff and took classes in the major entitled, "Psychology of Christian Experience," "Principles of Religious education," "Religious Education of Children," "Philosophy of Religious Education," "Improving the Teaching of Religion," "Improving Instruction in Colleges and Universities," and "Recent and Contemporary Educators" (Hug, 1965; New York University School of Education Bulletin, 1950). In addition, LeBar took an influential summer course at Teacher's College with John Dewey's disciple, William Heard Kilpatrick. His philosophy of education, rooted as it was in the importance of student interest, motivation, and purposeful activity, served as an important intellectual seedbed for LeBar's growing ideas. His "project method" seemed to operationalize much of what LeBar had gained in her schooling at Pestalozzi-Froebel, Central YMCA College, Wheaton, and NYU. Moreover, his teaching methods, which included small group inductive analysis and problem solving, became a compelling model for LeBar's own collegiate teaching style. Yet while these progressive educators had a profound influence on LeBar's growing philosophy, she also developed a keen interest in seventeenth-century educator John Amos Comenius while at NYU. A historical mentor of sorts, Comenius seemed to incorporate the best ideals of progressivism without falling prey to the relativism and anti-supernaturalism of philosophical pragmatism. His Great Didactic, written in 1657, communicated the importance of student self-activity, purposeful motivation to action, developmental appropriateness, and inductive methodology, leading students from the concrete to the abstract. What LeBar so appreciated about Comenius was his ability to balance what she called "inner factors" (the needs, desires, and motivations of students) and "outer factors" (the content of Scripture, the person of the teacher, and the classroom environment) without losing the importance of either. It remained a continual project for LeBar to cultivate an educational theory that embraced both realities (LeBar, 1958; LeBar, 1987). When it came time to choose a dissertation topic, LeBar's interest in curriculum design prompted her to write on the newly developed Presbyterian Faith and Life curriculum for children (Kennedy, 1980). Utilizing criteria established by Paul Vieth in 1947 and comparing the new lessons to the previous Presbyterian curriculum and to the Methodist graded series, she looked in particular at the relationship between content and experience in the curriculum (LeBar, 1951). In her conclusions, she praised the curriculum for its implied cooperation between home and church school, the exemplary balance between evangelism and discipleship, and the freedom given to students in developing their own convictions. At the same time, she proclaimed that the curriculum retained a content-heavy focus that lacked an appreciation for the needs and motivations of students. Both LeBar sisters left NYU without having completed their dissertations, but they were completed soon after their return. The Ph.D. degree was conferred to both sisters in 1951. Back at Wheaton in the 1950s, LeBar began to build a national reputation in the field of Christian Education. In addition to her teaching responsibilities on campus, she became a book review editor for Christian Life magazine (reviewing children's books), continued her curriculum writing for Scripture Press, taught regular Sunday school lessons at College Church in Wheaton, and became heavily involved in the work of the National Sunday School Association (N.S.S.A.). LeBar led many workshops for annual N.S.S.A. conferences related to teaching methodology, but her more critical role came as a leader of the newly formed Commission on Christian Education (Professors' Section) of the N.S.S.A. in 1951 (Murch, 1956; Warkentin, 1958). 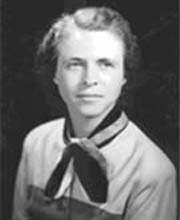 LeBar served as the 1952 program chairperson for this organization, later entitled the "Commission on Research in Christian Education," and her committee suggested that the organization should be devoted primarily to the cultivation of research and the formulation of an evangelical philosophy of Christian education that would secure widespread consensus. This Commission on Research was, in 1970, renamed as the National Association of Professors of Christian Education (N.A.P.C.E.). At Wheaton College, LeBar served on a variety of college committees, including the graduate committee, the scholastic honors committee, the spiritual life and standards committee, and the faculty welfare committee. As acting chair (1953-1959) and later department chair of the graduate department of Christian Education, LeBar felt a distinct need to contribute to the theoretical literature of the field. One of her continual frustrations was the paucity of strong theoretical books from an evangelical perspective. In order to fill this perceived gap, LeBar began work on a book that related to her core course, "Philosophy of Christian Education." In that class, LeBar asked her students to analyze the Gospels, looking inductively at the examples of Jesus' interactions with individuals and groups in order to secure educational principles from his methods. Asking questions related to the approach of the lesson and the relationship between inner and outer factors, the students of the class discovered that Jesus taught with a strong understanding of his students, that He related divine content to very concrete human realities in a way that secured strong motivation and action. These developing insights compelled LeBar to begin writing the book that would thrust her into the national spotlight. Education That is Christian, published for the first time in 1958, was a response to the poor teaching she witnessed in her many visits to local churches. Her observations of hundreds of evangelical Sunday school programs had revealed both lifeless teaching and content unrelated to the lives of students. Most evangelical teaching, she noted, was nothing more than "poor lay preaching," a proclaiming of the Word with no appreciation for the needs and life stage of the learners (LeBar, 1995, p. 26). LeBar felt that such a reality was related to the reliance on secular educational theories, Herbartianism in particular. Herbartianism was consumed chiefly with the correct organization of subject matter, the relationship of new material to old (apperception), and the belief that knowing would automatically result in doing, and LeBar surmised that most church teaching was rooted in these same assumptions. Although Clarence Benson's approach was rooted in a similar philosophy, her graduate training, particularly at NYU, had revealed a better way. Rooted in biblical illustrations from the life of Christ, Paul, and the Israelites, LeBar proposed a philosophy of Christian education that was rooted in a series of mutually reinforcing principles of growth in Christ. First, she suggested that the process of maturing in Christ required the engagement of inner resources: the emotions, will, and the power of perceived needs. Since needs were the motive force for all learning and action, she stated that teachers should begin with student felt needs in order to elicit interest and motivation for learning. With motivation generated in this way, the student would then be confronted with his/her real need and the written Word of God. This combination of student need and divine revelation would generate both a deeper relationship with the Living Word and transformed life growing in His image. Thus, the curriculum of Christian education for LeBar was, not Bible-centered but Word-centered, recognizing that the written word was a means to the end of communion with and transformation into the image of Jesus Christ. Furthermore, learning was described by LeBar as both active and continuous. An eager proponent of active learning, LeBar suggested that students be given continual opportunities to practice both engagement with the word and application of biblical principles. Comparing Sunday school scholars to spectators at a sporting event, she noted that teachers were failing to allow students the opportunity of assimilating information into their lives. Rather than communicating eternal truths to passive students, LeBar advocated a program in which teachers were facilitators, helping students to make discoveries in the Word related to their concrete life situations. Only in this way would the truths of Scripture become integrally infused in life as fruit as opposed to the lifeless ornamentation of the Christmas tree. Like Dewey, LeBar suggested that the best way to help students prepare for the future was to help them solve current problems, forming habits of inquiry that would continue to guide them in the future. In addition, LeBar placed great emphasis on the role of the Holy Spirit in the teaching/learning process. LeBar noted that, despite the importance of improved methodology, the work of the Holy Spirit was the only meaningful agency of transformation. Because the Spirit is so intimately involved in making the outer Word an inner experience, LeBar proclaimed that the teacher must be continually receptive to the Spirit's promptings, both in prayer before the teaching session and in the midst of teaching practice. In every way, LeBar sought to emphasize these themes in her own teaching, and former students recall that she continually opened her home for social activities that allowed her to get to know them as individuals. The 1960s brought many new challenges, not the least of which was a pervasive anti-institutional bias that threatened the department's focus on church education (M. LeBar, 1972). To ensure continued relevance in these changing times, LeBar, as chair of the graduate Christian Education department, hired Lawrence Richards, a specialist in youth ministry and church renewal. Together with Richards, the LeBars organized a national church renewal conference at Wheaton's Honey Rock Camp in Wisconsin in June of 1967 (Richards, August-November 1967). The conclusions drawn by these educators, together with twenty-four church leaders from around the country, were rooted in the need for the church to become a more effective organism defined by close intimate relationships and the mutual use of spiritual gifts. Although this became the heart of Richards' crusade-like zeal for cell groups and church reform, LeBar took a more cautious approach to the entire discussion. While she appreciated Richards' perspectives, her emphases were rarely institutional in nature, and she was somewhat skeptical of the possibility of radical and immediate change. As in her educational philosophy, she saw the need to begin where people were, to draw on their own motivations so that they would take ownership of the task of church renewal. LeBar's final book publication, Focus on People in Church Education (1968), picked up on these themes. LeBar suggested that the focus on institutional structures in church education had fostered a loss of concern for the unique individual. "The most important thing in life," she stated in the introduction, "is personal relations: being rightly related to God, to oneself, to others"(p. 11). Describing the Church as an organism that resists institutional delimitation, LeBar set forth in this book a vision that focused upon leadership and the need to begin all planning with a conscious picture of the "student" in mind at all times. While LeBar did not neglect issues related to the administration of Christian education in the local church, the emphasis in this book is on the personal development of both students and teacher/leaders. Upon retiring from Wheaton College, LeBar took advantage of several opportunities to spread her ideas internationally. In 1975, both sisters responded to a plea from Dr. William K. Warner of the College of Southern Africa to assist in teacher training in Rhodesia (present-day Zimbabwe). A new law had given local denominations complete freedom to teach the Bible in the public schools, but few trained teachers could be located to capitalize on this opportunity. The LeBar sisters led "Teaching for Results" seminars all over the country and also participated in an "Interracial Congress on Evangelism in Context" (Carr, 1976). In addition, they helped develop a collegiate level Christian education program with former student Eileen Genheimer at the Johannesburg Bible Institute. Following this, they also brought their training seminars to Asia, sponsored by Bong Ro of the World Evangelical Theological Commission. After two other extended teaching trips in Regina, Canada and Central America (with former student Dorothy McCullough), the LeBar sisters finally retired from their teaching responsibilities. In 1980, at the age of 73, Lois LeBar left Wheaton with her sister and moved to Shell Point Village, a Christian and Missionary Alliance retirement community in Fort Myers, Florida. Life and travel continued without incident until Mary LeBar succumbed to a heart attack during a vacation to the west coast in 1982. After years of living and working together, this was a significant loss. Lois LeBar stayed at Shell Point Village, enjoying time to read and study. Favorite authors in her later life included A.W. Tozer and Amy Carmichael, and she daily spent time in a devotional book entitled Daily With the King, by former Wheaton professor Glyn Evans. She also continued to work with former students, co-authoring Bible studies and curricula that have been used in various locations. This pioneer Christian educator died in August of 1998 at the age of ninety. While several honors point to her significant contributions to the field - including the Alumni of the Year award at Moody Bible Institute, the Distinguished Christian Educator Award from NAPCE, and a LeBar classroom at Wheaton College, her real legacy continues on in the lives of her graduates spread throughout the world. LeBar's contributions to the field of Christian education can be assessed on a number of levels. She has been recognized by such authors as Harold Burgess, Robert Pazmino, Kenneth Gangel and Warren Benson as a representative evangelical theorist for twentieth century Christian education. LeBar can be seen somewhat as a bridge figure between the modernization of American education and the conservatism of the evangelical subculture in the mid-20th century. She was immersed in both worlds. On the one hand, she had grown up in the church, been a Sunday school teacher from age twelve, graduated from a highly conservative and traditional Bible Institute, and taught in many conservative evangelical churches. On the other hand, she had also taught in the public schools, attended three modern educational teachers colleges (with a B.A. in psychology), and received her doctorate from a decidedly "progressive" institution. Thus, in her life and in her personal philosophy, we have the underpinnings of a larger national struggle between modernism and fundamentalism, between religious education and the more traditional Christian education. In Burgess' estimation, LeBar is a model of the evangelical/kerygmatic tradition, a category marked by allegiance to the authority of Scripture, the transmission of a unique and revelatory message, and the practical application of this message in daily life (Burgess, 1996, p. 152). While this is certainly the most logical categorization in Burgess model, this placement perhaps obscures LeBar's chief contribution to the field of evangelical Christian education. Carefully observing churches and Sunday schools in which dry orthodoxy and dead formalism were rampant, LeBar proclaimed that the transmission of information was inadequate for producing growth and spiritual transformation. She was opposed to educational systems that placed solitary emphasis on either inner factors or outer factors. Like the developmentalists, she found a middle ground between the rampant existentialism and the behaviorism of her day. She knew students should not be given ultimate freedom and an open-ended goal of self-actualization in the school, but she also knew that it was equally detrimental to reduce students into passive and inert receptacles for her knowledgeable insights. LeBar recognized the importance of the internal needs and motivations of the pupil, not only for generating interest but also for creating a potent setting for the dynamic interplay of Word and life. Since student needs were described as God-given, LeBar posited that they would be the divinely ordained motive force for linking truth to life in a way that would involve the mind, the heart, the emotions and the will. As Robert Pazmino and James Plueddemann both suggest, one of LeBar's major contributions was to develop a philosophy of Christian education that was both Word-centered and methodologically progressive (Pazmino, 1988, pp. 145-147; LeBar & Plueddemann, 1995, pp. 56-61). With an obvious indebtedness to progressive educators like John Dewey and William Heard Kilpatrick, she suggested that the teaching-learning process involved an active process of discovery. Again picking up on themes developed by progressive educators, LeBar noted that students were often categorized as spectators rather than participants in the learning process. In noting that "teachers should not do for students what they can more profitably do themselves," LeBar is suggesting that students must have first-hand interaction with the written Word and the living Word rather than relying on the second-hand experiences of teachers. Like the good tour guide, she noted, the teacher must be able to serve as a knowledgeable guide and fellow pilgrim without diminishing the students' personal experiences with the Lord. LeBar knew that Christian educators, though they obviously could not tolerate the underlying metaphysical presuppositions of the progressive educators, should not discard the important lessons gained from these theorists. LeBar did accomplish a great deal in her lifetime. She was one of the first writers of the All-Bible Graded series curriculum, a job she maintained for about 40 years at a crucial juncture in the history of evangelical curriculum writing. By providing orthodox curriculum based on sound educational principles, LeBar and her colleagues provided solid Bible lessons for literally millions of children across the country. At a time when very few evangelical textbooks existed in the field, Education That is Christian served as a powerful statement. Perhaps one of the most enduring components of this book was the description of the teaching/learning process as a movement from the life experience of the person to the unchanging truth of the Word to the personal action flowing from the link between experience and content. Originally entitled the boy-book-boy model of Christian education (and later revised to a more inclusive person-book-person or way-truth-life), this approach, as Jim Plueddemann has suggested, has had a lasting influence on evangelical curriculum design (LeBar & Plueddemann, 1995, p. 101). LeBar's legacy remains intact, not only in her published writings, but also in the many graduates who have gone into positions of church and parachurch leadership, missions, and academia. Many current leaders in the academic field of evangelical Christian education, including Dr. John Dettoni, Dr. James Plueddemann, Dr. Julie Gorman, and Dr. Gene Getz, completed their master's degrees under Lois LeBar. At least thirteen colleges and seminaries have LeBar graduates on their faculty, multiplying the extent of her influence exponentially. The founder of Frontiers mission agency, Dr. Greg Livingstone, was a LeBar student, and recent Christian education directors for the Christian and Missionary Alliance and Assemblies of God also studied under LeBar. Other recognized leaders, such as Bill Gothard and Phillip Yancey, also attained their M.A. under this model teacher. Dr. James Plueddemann provides a helpful analysis of LeBar when he reveals that she was actually well ahead of her time in her analysis of the teaching methods of Jesus. As he notes, before Piaget, LeBar emphasized the need for pupils to be actively involved in a learning process appropriate to their developmental level. Before he popularized the concept of disequilibration, she recognized the need for teachers to begin with "tensions raised by felt needs" in the promotion of spiritual development. Before Paulo Freire, LeBar spoke of beginning with the "problems" of students. Before Elliot Eisner, she advocated both creativity and flexibility in teaching toward unknown and unseen spiritual ends. Before Thomas Groome's analysis of "shared praxis," she spoke of the need to move from "practice to theory rather than theory to practice." (LeBar & Plueddemann, 1995, p. 106). For LeBar, such insights were provided by unlocking the truths of Scripture and the examples of teachers in the biblical narrative. She thought it only natural that Christians should discover truth about education before the secularists, since Christian should have greater access and divine insight into the eternal truth of the gospel. This source of wisdom and insight explains much of the timelessness of LeBar's model of evangelical Christian education. Benson, C. (1934). Annual report of the director of Christian education course of the Moody Bible Institute. Unpublished manuscript, Moody Bible Institute. Benson, C. (1936). Annual report of the director of Christian education course of the Moody Bible Institute. Unpublished manuscript, Moody Bible Institute. Burgess, H. W. (1996). Models of religious education. Wheaton, IL: Victor Books/Bridgepoint. Carr, M. (1976, October 3). Ex-college teachers find Rhodesia's problem one of harsh black and white. Wheaton Daily Journal, pp. 1-2. Congdon, C.E., Doty, W.J., & Thornton, L.H. (1940). The historical annals of southwestern New York. New York: Lewis Historical Publishing Co., Inc.
Comenius, John Amos. (1991). The great didactic of John Amos Comenius: Translated into English and edited with biographical, historical, and critical introductions by M. W. Keatinge. Kila, MT: Kessinger Pub. Evans, Glyn. (1979). Daily with the King. Chicago, IL: Moody Press. Gangel, K., & Benson, W. (1983). Christian education: Its history and philosophy. Chicago: Moody Press. Getz, G. (1969). The story of MBI. Chicago: Moody Press. Hug, E. A. (1965). Seventy-five years in education: the role of the school of education, New York University, 1890-1965. New York: New York University Press. Kennedy, W. B. (1980). Neo-orthodoxy goes to Sunday school: The Christian faith and life curriculum. Journal of Presbyterian History, 58 (4), 326-371. LeBar, L. (1945). Children in the Bible school: A textbook for teachers. Unpublished master's thesis, Wheaton College, Wheaton, IL. LeBar, L. (1951). The contribution to protestant curriculum theory of the organizing principle of the 1948-49 Presbyterian "faith and life" curriculum for the children's division. Unpublished doctoral dissertation, New York University, New York. This dissertation is also cited in Abstracts of Doctoral Dissertations in Religious Education, 1950-1951. (May-June 1952). Religious Education 47 (3), 219-220. LeBar, L. (1952). Children in the Bible school: The HOW of Christian education. Old Tappan, NJ: Fleming Revell Publishing Company. LeBar, L. (1958). Education that is Christian. Old Tappan, NJ: F.H. Revell Publishing Company. LeBar, L. (1968). Focus on people in church education. Old Tappan, NJ: Fleming Revell Publishing Company. LeBar, L. (1987). What children owe to Comenius. Christian History, 6(1), 19. LeBar, L., & Plueddemann, J. (1995). Education that is Christian. Wheaton, IL: Victor Books. LeBar, M. (1972). Wonder Programs for Fours and Fives. Wheaton: Scripture Press. Moody Bible Institute Bulletin. (1959). Alumnus of the Year. Moody Bible Institute Bulletin, (Vol. Unknown), Page unknown. Murch, J. D. (1956). Cooperation without compromise: A history of the National Association of Evangelicals. Grand Rapids, MI: William B. Eerdmans Publishing Company. Palmer, J. (1958). The contribution of Clarence H. Benson to the field of Christian education. Unpublished master's thesis, Wheaton College, Wheaton, IL. Pazmiño, R. (1988). Foundational issues in Christian education. Grand Rapids, MI: Baker Book House. Richards, L. (1967). Perspective on purpose. United Evangelical Action. 26 (6), 4-5, 16. Warkentin, E. (1958). The history of revitalizing the Sunday schools of America through the NSSA. Unpublished master's thesis, Wheaton College, Wheaton, IL. LeBar, L. (1939, April). The value of pictures. Church School Promoter. LeBar, L. (1939, May). Artistic beauty. Church School Promoter. LeBar, L. (1939, June). The use of pictures. Church School Promoter. LeBar, L. (1939, July). Variations in the use of pictures. Church School Promoter. LeBar, L. (1939, August). Displaying pictures. Church School Promoter. LeBar, L. (1939, September). Sources for pictures. Church School Promoter. LeBar, L. (1939, October). Flannelgraphs. Church School Promoter. LeBar, L. (1939, November). Advantages of bringing the gospel to children. Church School Promoter. LeBar, L. (1939, December). Advantages of bringing the gospel to children. Church School Promoter. LeBar, L. (1940, January). Special qualifications for teachers of children. Church School Promoter. LeBar, L. (1940, February). The importance of individuality. Church School Promoter. LeBar, L. (1940, March). Individual differences. Church School Promoter. LeBar, L. (1940, April). Between natural birth and spiritual birth. Church School Promoter. LeBar, L. (1940, May). Regeneration not profession for children. Church School Promoter. LeBar, L. (1940, June). Train up a child. Church School Promoter. LeBar, L. (1940, July). The "why" and "what" of scripture memorization. Church School Promoter. LeBar, L. (1940, August). The "how" of scripture memorization. Church School Promoter. LeBar, L. (1940, September). The "where" of scripture memorization. Church School Promoter. LeBar, L. (1940, October). Teaching reverence. Church School Promoter. LeBar, L. (1940, November). When do children worship? Church School Promoter. LeBar, L. (1940, December). What hinders real worship? Church School Promoter. LeBar, M. E., and LeBar, L. E. (1941). The story of Preeta (filmstrip). Chicago: Scripture Press. LeBar, L. (1941, January). What shall the children sing? Church School Promoter. LeBar, L. (1941, February). Do you really teach new songs? Church School Promoter. LeBar, L. (1941, March). Building attitudes. Church School Promoter. LeBar, L. (1941, April). The concrete versus the abstract. Church School Promoter. LeBar, L. (1941, July). Impromptu object lessons, part 1. Church School Promoter. LeBar, L. (1941, August). Impromptu object lessons, part 2. Church School Promoter. LeBar, L. (1941, September). From home to Sunday school. Church School Promoter. LeBar, L. (1941, May). Meeting basic emotional needs, part 1. Church School Promoter. LeBar, L. (1941, June). Meeting basic emotional needs, part 2. Church School Promoter. LeBar, L. (1941, October). Freedom and authority. Church School Promoter. LeBar, L. (1941, November). Play in the church nursery. Church School Promoter. LeBar, L. (1941, December). Children can be trained to give. Church School Promoter. LeBar, L. (1942, January). What about the unchurched home? Church School Promoter. LeBar, L. (1942, February). What about the unchurched home? Church School Promoter. LeBar, L. (1942, March). God's own teaching methods. Church School Promoter. LeBar, L. (1942, April). Special day programs, part 1. Church School Promoter. LeBar, L. (1942, May). Special day programs, part 2. Church School Promoter. LeBar, L. (1942, October). Celebrating birthdays. Church School Promoter. LeBar, L. (1942, November). Teach us to pray. Church School Promoter. LeBar, L. (1942, December). Children's prayers. Church School Promoter. LeBar, L. (1943, January). Are children's prayers mechanical or vital? Church School Promoter. LeBar, L. (1943, February). Organization: A means to an end. Church School Promoter. LeBar, L. (1951a). How to survive. Wheaton College Faculty Bulletin, 37-38. LeBar, L. (1953, June). What does a Christian education director do? Christian Life, 76, 85. LeBar, L. (1955) Called to teach: Scriptural method for teachers in the local church. Wheaton, IL: Evangelical Teacher Training Association. Gorman, J., and LeBar, L. (1960). Church-time for juniors: Junior church course for pupils in grades 4-6. Wheaton, IL: Scripture Press Foundation. LeBar, L. (1964). Curriculum. In J. E. Hakes (Ed. ), An introduction to evangelical Christian education (pp. 86-95). Chicago: Moody Press. Gray, E., Howse, W., and LeBar, L. (1969). Religious education, 125. Nashville: Seminary Extension Department of Southern Baptist Seminaries. LeBar, Lois. (1970, October 23). Creative Bible teaching [Review of the book Creative Bible teaching]. Christianity Today, 15, 21-22. LeBar, L. and Kazuo, T. (1971). Kirisutokyo no kyoiku: Sono kiso kara jissen made. Tokyo: Inochi no Kotobasha. LeBar, L. (1973). Family devotions with school-age children: Creative guidelines for Christian parents. Old Tappan, NJ: Fleming Revell Publishing Company. LeBar, L. (1981). Planning for teaching. In W. C. Graendorf (Ed. ), Introduction to biblical Christian education (pp.??). Chicago: Moody Press. LeBar, L. (1981). Education that is Christian, 2nd ed., Old Tappan, NJ: F.H. Revell Publishing Company. LeBar, L. and Berg, M. (1983). Llamados a ensenar. Miami: Editorial Caribe. LeBar, L. (1984). Plan to succeed: Expert advice from a teacher of teachers. Evangelizing Today's Child 11, 17-19. LeBar, L., and Plueddemann, J. (1989). Education that is Christian (Revised ed.). Wheaton, IL: Victor Books. LeBar, L., and Plueddemann, J. (1995). Education that is Christian. Wheaton, IL: Victor Books. Burgess, H. W. (1975). An invitation to religious education. Birmingham, AL: Religious Education Press. Congdon, C.E., Doty, W.J., and Thornton, L.H. (1940). The historical annals of southwestern New York. New York: Lewis Historical Publishing Co., Inc.
Gangel, K. and Benson, W. (1983). Christian education: Its history and philosophy. Chicago: Moody Press. Heidebrecht, P. (1991). The educational legacy of Lois and Mary LeBar. Unpublished manuscript. LeBars strive to teach of Christ. (1975, June 5). The Wheaton Record, 7. Pazmino, R. (1988). Foundational issues in Christian education. Grand Rapids, MI: Baker Book House. Richards, L. (1967). Shape of things to come? United Evangelical Action, 26 (7), 12-14, 23-24. Richards, L. (1967). Strategy for tomorrow. United Evangelical Action, 26 (8), 16-18, 33-35. Richards, L. (1967). Twentieth century re-formation. United Evangelical Action, 26 (9), 14-16, 34-35. Richards, L. (1968). Tomorrow's church today. United Evangelical Action, 27 (4), 22-36. Richards, L. (1968). Tomorrow's church today. United Evangelical Action, 27 (5), 16-23. Schwarze, P. (1984, October 10). Dr. Lois LeBar lives by values. The Wheaton Leader. p. 8. Setran, D. (1994). The spiritual and intellectual formation of Lois E. LeBar and an assessment of her contributions to the field of Christian education. Unpublished masters thesis, Wheaton College, Wheaton, IL. Towns, E. (1969, April). What do we communicate? Christian Life, 22-23, 43-49. [A dialogue between Lois LeBar, Jack Hyles, and Dr. Richard Ford, a professor from Garrett Theological Seminary]. Towns, E. (1969, May). What do we communicate? Christian Life, 26-27, 29-33. Women-on-the-go - Dr. Mary and Dr. Lois La Bar [sic] (1968, March 17) The Sunday Journal (Wheaton). Filkin, W. (1952). Children in the Bible school [Review of the book Children in the Bible school]. Moody Monthly, 53 (4), 312. Garner, H. (1958). Education that is Christian [Review of the book Education that is Christian]. Moody Monthly, 59 (1), 72. Garret, C. (1968). Focus on people in church education [Review of the book Focus on people in church education]. Eternity, 19 (10), 44-45. Getz, G. (1968). Focus on people in church education [Review of the book Focus on people in church education]. Moody Monthly, 69 (1), 57. Guthrie, D. (1959). Education that is Christian [Review of the book Education that is Christian]. Sunday School Times, 101 (8), 145. Heaton, C. A. (1958). Education that is Christian [Review of the book Education that is Christian]. Eternity, 99 (9), 40-41. Miller, L. (1968). Focus on people in church education [Review of the book Focus on people in church education]. Christianity Today, 12 (23), 36-7. Talbot, G. (1953). Children in the Bible school [Review of the book Children in the Bible school]. Sunday School Times, 95 (12), 256-257. LeBar, L. & Plueddemann, J. (1995). Education that is Christian (Revised ed.). Wheaton, IL: Victor Books. (p. 244). The divine Teacher, with the cooperation of the human teacher, leads the pupil from his current need in to the Word, where he gains new insight into the truth, then out again to practice the Word in daily life situations. The pupil's experience impels her to seek knowledge of the Word, which in turn commands her to return to life to practice the truth. The real test is the amalgamation of inner and outer forces until it is difficult to separate them. The Word becomes flesh, and our mortal bodies reflect the Word. LeBar, L. (1968). Focus on people in church education. Old Tappan, NJ: Fleming Revell Publishing Company. (p. 34). It is generally conceded that there are three kinds of aims: knowledge aims, attitude aims, and conduct aims (which may include skills). Most lessons should incorporate all three kinds, for people need to know what God says, to feel as He does about the truth, and to obey what He says…We can never take it for granted that when people learn a new truth they will automatically obey it. At the very time they discover it, they should decide what they will do about it and visualize how it would be possible to carry it out. Too many Christians have formed a habit of hearing but never doing, for it is much easier to understand a new idea than to put it into practice. Only when all three types of aims are combined has the learning process been completed. LeBar, L. (1952). Children in the Bible school: The HOW of Christian education. Old Tappan, NJ: Fleming Revell Publishing Company. (p. 204). Making a few spiritual concepts real and vital to children is much more valuable than trying to stuff their minds with many words which merely bore them. If they see the need of a few basic concepts which give meaning to life at present, they will acquire a taste for the things of the Lord and later will seek them for themselves. Teachers will beware of too many short cuts to learning and of relying heavily on the vicarious experiences of others to teach the truth of God. He seeks a personal relationship and dealings with each individual. LeBar, L., & Plueddemann, J. (1995). Education that is Christian (Revised ed.). Old Tappan, NJ: Fleming Revell Publishing Company. David Setran is Assistant Professor of Educational Ministries at Wheaton College, where he teaches courses related to the history and philosophy of Christian education, discipleship, and college ministry. His master's thesis in the Wheaton College Graduate School (1994) explored the life, ministry, and influence of Lois LeBar.